On April 12, figures of Ezra Miller as the Flash and Ray Fisher as Cyborg will join the ranks, designed in collaboration with Warner Bros. Consumer Products and DC. Both figures have been recreated to look identical to the DC Super Heroes’ appearances and costumes from the film. Each figure will also have their own mission for guests to complete while inside the experience at Madame Tussauds Orlando. With Cyborg, guests will have to locate a hidden code and transmit it to the half-man, half-robot through a nearby keypad. Cyborg will then use the power of technology to project a hologram that reveals the location of the device Lex Luthor is using to wreak havoc on the city. 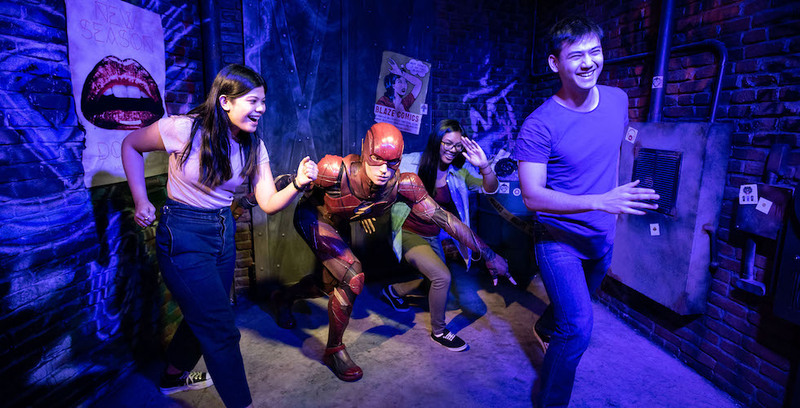 Guests will find the Flash fighting crime in an alleyway that features original artwork from “Justice League.” Visitors will have to run in place alongside the Flash, while a speedometer shows their speed. Justice League: A Call for Heroes is exclusive to Madame Tussauds Orlando and Sydney, and offers a unique and hands-on experience for fans of the DC Super Heroes. The experience also features figures of Jason Momoa’s Aquaman, Gal Gadot’s Wonder Woman, Henry Cavill’s Superman, and Ben Affleck’s Batman. To learn more about Madame Tussauds Orlando and to purchase tickets, visit MadameTussauds.com/Orlando.